Have you ever picked a pod and popped the fresh peas straight into your mouth? No? You should try it some time. There's nothing like that just-picked taste. Of course, you will probably grow most of your peas for cooking, but when you can just walk out into your garden and pick them to use right away, they're good enough to make a respectable addition to a salad. There are a few semi-leafless varieties, which are self-supporting, and purple-podded varieties with attractive purple flowers are also available, as well as mange touts or sugar snaps and petits pois. Peas are a cool weather crop, growing best in Spring and cool Summers, disliking intense heat. Provided it has ample moisture, the summer crop can be grown in semi-shade. Peas like an open but not exposed position. Soil should be fertile and deeply cultivated. A trench can be prepared 20cm (8") deep x 60cm (2') wide and filled with organic matter, on which the peas will grow well without requiring additional nitrogen. Ideal pH is 7. Sowing is traditionally into a 15cm (6") wide drill, 5cm (2") deep, with seeds spaced 5-8cm (2-3") either way. Distance between drills should equal the expected height of the mature plants. Alternatively, they can be sown in rows at the same spacing. Early crops are sown closer together, to allow for expected losses due to cold, damp conditions. A more recent recommendation is for triple rows, 11cm (4½") apart with seeds 11cm (4½") apart in the rows. Each triple row is 45cm (18") from the next. This latter method is said to encourage extended cropping. Once the seed is sown, mouse traps can be set beside the rows, particularly for early and over-wintered sowings. Protect from birds with black cotton strung across the rows or with wire or net pea-guards. Fleece or cloches would also provide protection, and speed germination of early crops. Unless conditions are very dry, watering is unnecessary until the peas start to flower, when 20 litres (4 gallons) per square metre/yard per week will increase both yield and quality. 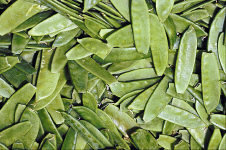 Peas need support, which is traditionally provided by inserting pea sticks at regular intervals, to form small wigwams. However as peas can be subject to mildew if they are overcrowded, an alternative method has become popular, where the pea sticks are inserted on either side of the trench, leaning outwards in a sort of truncated V shape. More elaborate support can be provided in the form of pea netting or chicken wire strung between posts. Finally, if growing in standard 120cm (4') wide beds, they can be spaced at 7½cm x 7½cm (3"x3"), and a strong netting fence around the outside is supposed to provide sufficient support, the plants in the middle supporting each other. To be honest, in my experience, it is very difficult to get at the centre portion of the crop at all if you grow them in beds like this, particularly if you get a good crop. My suggestion is that you have a couple of traditional trenches on either side of the bed, and leave the space between empty for extra airflow. You could put a few stepping stones or a scaffolding plank to walk on when you're picking, down this centre aisle, so you don't compact the ground too much. Peas should be picked regularly to encourage cropping. Pods should be cut from the vines with scissors, to avoid damaging the plants, while they are still bright green and smooth, for the best tasting peas. If grown for drying, leave the plants and pods to dry in situ as long as possible, then hang whole plants in a dry, airy, sheltered place until the pods are dry enough to split open. Alternatively, sow a first early, e.g. Kelvedon Wonder, successionally. Birds and mice cause the most damage to unprotected crops. Pea moths have maggots that bore through the pods and into the peas (If you grow early or late crops you may escape this pest). Thrips are minute black or yellow insects which cause distorted pods and reduced yield. Fusarium wilt is also on the increase; if affected the best approach is to stick to the resistant varieties which are available. Cold wet conditions and/or overcrowding can lead to damping off and mildew.